9019 Pomroy and Parker, Bristol, Conn. 8-day steeple clock. This is a maker you seldom encounter because they were only in business from 1852 to 1857. This clock has a very clean, refinished mahogany case. The finial tips are perfect and the case has no veneer chips but I think the 1 inch piece on the front just under the left corner block has been replaced because the color is a bit different. Both glasses are original with the lower reverse decorated tablet having a scene of Buckingham Palace. The white building portion of that painting has flaked away. It has a good original painted dial with raised chapter ring. The numerals are all very crisp and clear. The label is complete and very legible. The clock comes with the original pendulum, hands and key. This is an eight-day clock with hourly strike on a gong. The unsigned movement is long overdue for a cleaning. 9020 Fine, early Brewster & Ingrahams, Bristol, Conn. This is a good, desirable clock worthy of any collection. The mahogany case has been very nicely refinished. The only case flaw is a small sliver off the top of the left finial. Note that these earlier clocks had coned finials, not turned. Both glasses are original and the lower reverse decorated glass is perfect without one chip or lifting spot. It has a colorful floral center. The painted zinc dial is original with just a little wear to some of the numerals. The label is complete and quite legible. It comes with the original pendulum and key. The minute hand is a replacement of the proper style. This is a 30-hour clock with strike on a gong. It runs a short while for me before stopping. It has a signed, brass, ribbed movement and has somehow managed to retain both original brass mainsprings. At this stage, those mainsprings do not have much power and that may account for the clock not continuing to run. 19 ½ inches tall. $175. 9021 New Haven Clock Co. 8-day steeple clock. In “as found” condition, the mahogany case has had numerous visible veneer repairs. The dial is a replacement but the original dial, with flaking, is included with the clock. Both glasses are original but the background color of the lower glass has flaked away. The label is complete but it is dark and difficult to read. It comes with an old pendulum and key. The hands are replacements. This is an eight-day clock with hourly gong strike. It is running but the strike click needs to be repaired. 19 ½ inches tall. $85. 9022 Early Brewster & Ingrahams steeple clock. 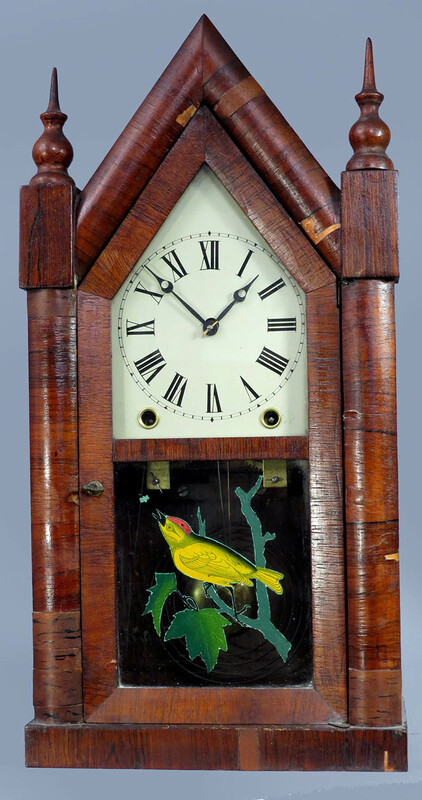 This clock is a little bit unusual because at only 8 ½ inches wide it is smaller than normal. Sort of a three-quarter size. The mahogany case is very clean and has been nicely refinished. The only real flaw to mention on the case is the missing door escutcheon. I think the painted zinc dial may have had a clear coating applied and that coating has now yellowed. The label is much better than average, complete and very legible. Both glasses are original but the frosted fountain scene has a fair amount of loss. The clock comes with the original pendulum and key. The minute hand is a replacement of the correct style. This is a 30-hour flat plate movement which is signed and retains one original brass mainspring. As a bit of an oddity, the strike trip was designed to extend through the left peak of the case. The movement looks clean and it seems to be in good running order. 9023 Gilbert eight-day steeple clock. The mahogany case has a rather unusual case style. There are several small and minor veneer chips along the bottom edge and one small chip at the very peak but it is otherwise fine. It has what appears to be a clean original finish. The gold decoration around the door is in pretty good condition and that is not normally the case. It has a replacement zinc dial. The label area has been protected with mylar. The pendulum has been altered to be more visible in the pendulum view window. This is an eight-day clock with hour and half hour strike on a gong. Someone has made a new verge for it but it seems to be functioning and the clock is running. 9024 Waterbury eight-day steeple clock. This refinished mahogany case is in reasonably good condition but for the chip on the right finial tip. This is a little bit different case style with a full door having a gold molding around the edge. That gold is still in reasonably good condition and the stork glass is the original. The dial and pendulum are replacements. There are two good labels on the back stating that this model is the “Large Gothic VP” ( visible pendulum). This is an eight-day model with a signed movement which strikes on the hour and half-hour. It runs for me for a while before stopping. 19 ½ inches tall. $65. 9025 New Haven miniature steeple clock. The small size of this clock helps it to fit in just about anywhere. This mahogany case has a very clean, original finish with only two small veneer chips on the left side of the base. Both finials are perfect. Both glasses are original. The lower glass has a reverse decoration of a rose and it is without chips or flaking. The painted zinc dial has been touched up and the numbers have been redone. It was a pretty good job and it looks fine. It has a very good label plus the original hands and pendulum. This is a 30-hour clock plus alarm and it is running. This mahogany case is done with figured veneers and the refinishing job was excellent. There are no veneer chips and the finials are perfect. Both glasses are original and the reverse decorated tablet has only a few tiny paint losses. The label is almost like new and the painted dial is in very good condition with just a bit of paint loss around the screw holes. It retains the original hands and pendulum. This is a 30-hour clock with hourly strike on a gong and it is in good running order. You will not need much room on your shelf for this little clock and it is ready to go. This clock has a very clean, original finish. It is in very good condition but for some veneer chips around the base. The finials are original and have not been damaged. Both glasses are original. The lower tablet has had the background repainted with silver paint. The label is a little dark but still quite legible. It has the original painted zinc dial with some flaking areas. The hands and pendulum are original. This is a 30-hour clock which strikes the hours on a coiled gong. The movement will need a cleaning to put it in good running order. 8022 Waterbury “Large Gothic V.P.” steeple clock. 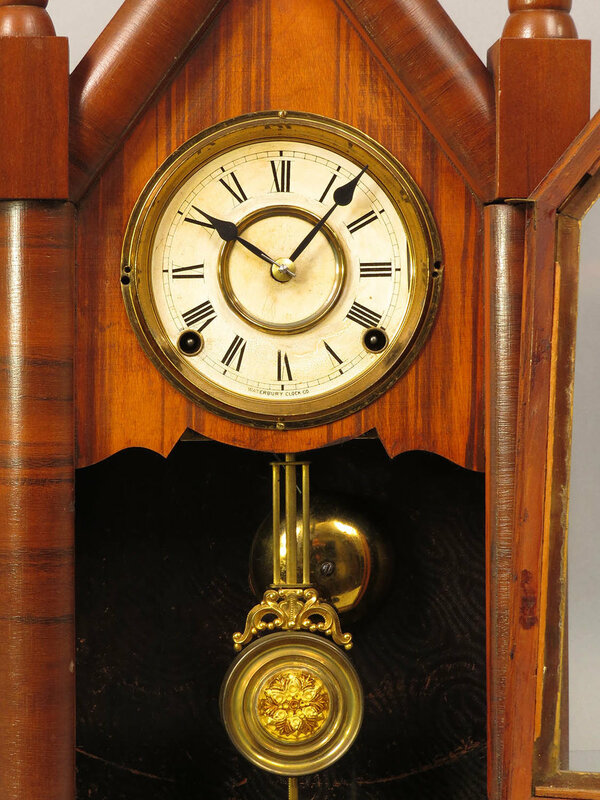 This clock has a mahogany case which is very clean and refinished but note that the front edge of the base has had the veneer removed and has been colored to match. You actually need to look quite closely to see that this has been done. I believe the finials are replacements. 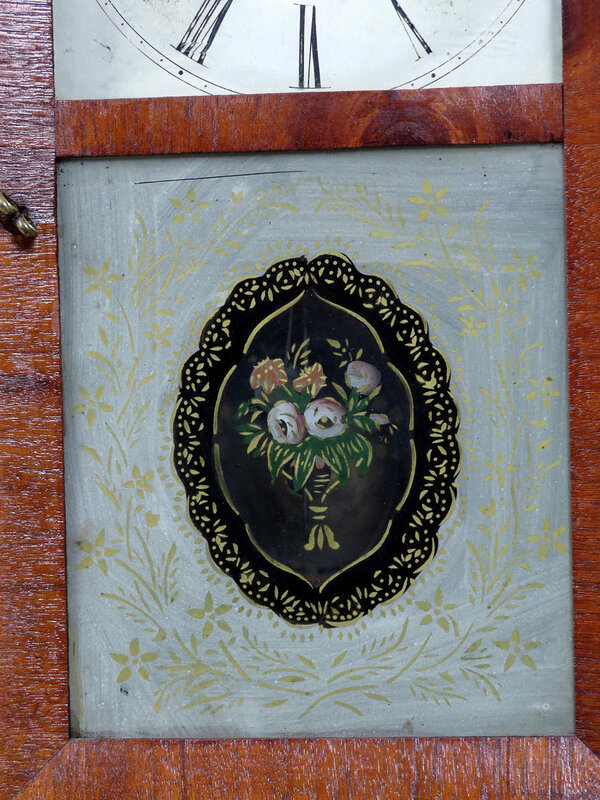 It has the original glass with a gilt frame around the door interior. 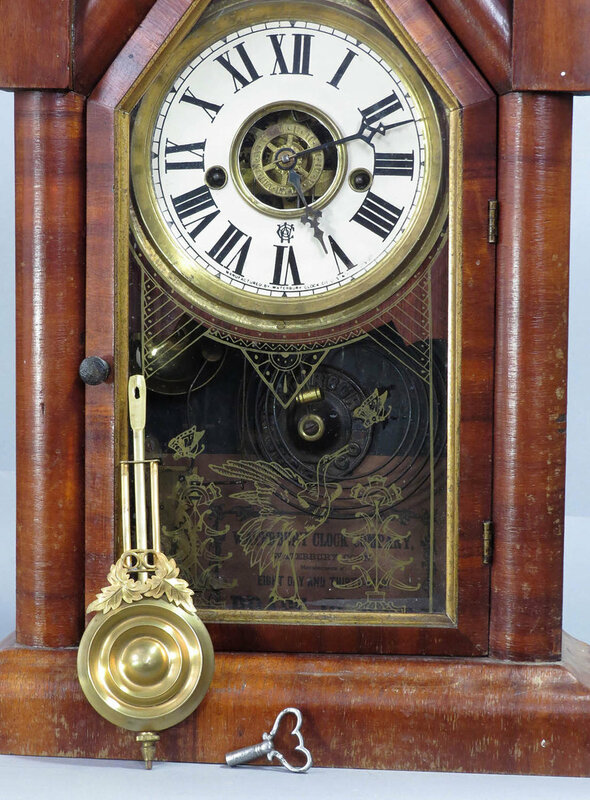 There is an excellent signed dial and a fancy brass pendulum with a cut glass center. The hands have been replaced. 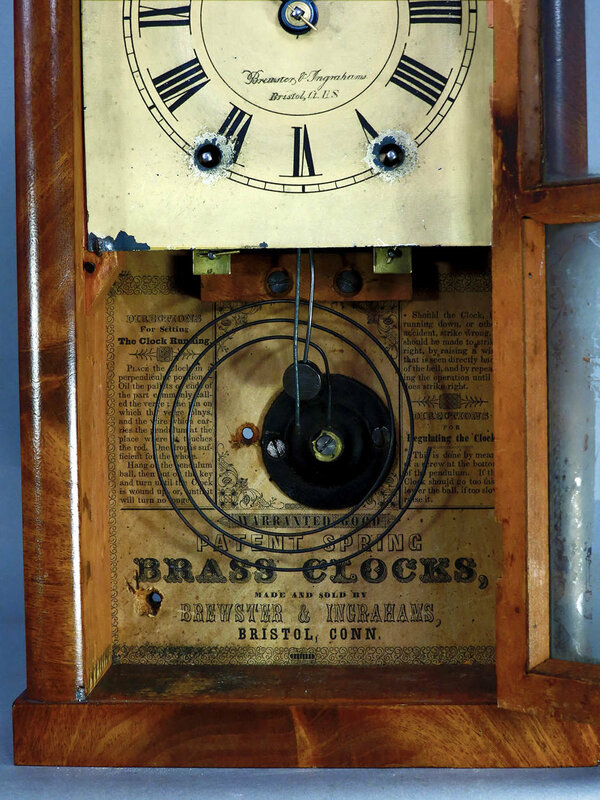 This is an eight-day clock with hourly strike on a brass bell and it seems to be in good running order. 19 ½ inches tall. $110. 4015 Atkins Clock Co. steeple clock. You do not usually see steeple clocks by this maker who is normally associated with earlier style cases. This mahogany case has the original finish and it is very clean but it might need a bit of attention. The inside of the lower left of the door has come apart and there is a piece missing. It has been glued back together and it is stable so it could be used just as it is. There are a couple small veneer chips on the corners. The painted zinc dial has some flaking around the center arbor and the silverfish have eaten away the plain part of the label while leaving the printed portion. The reverse painted glass is the original but the background painting around the corners has been scraped away. This is a 30 hour clock with hourly strike. It has the original hands and pendulum and it is running.